Friends of the Rappahannock has been working with a multitude of partners for over a year to actualize an amazing restoration project as a part of our Student Stream Team (SST) program. On October 20-22, 2015 the year long effort was realized as over 40 students from the Glenn’s Campus of the Chesapeake Bay Governor’s School (CBGS) worked with staff from Friends of the Rappahannock (FOR) and Ready Reef inc to install two restoration projects in the Town of Urbanna. FOR’s Student Stream Team program began in 2008 as a new program designed to integrate in-class environmental education with outdoor, on the ground restoration projects. 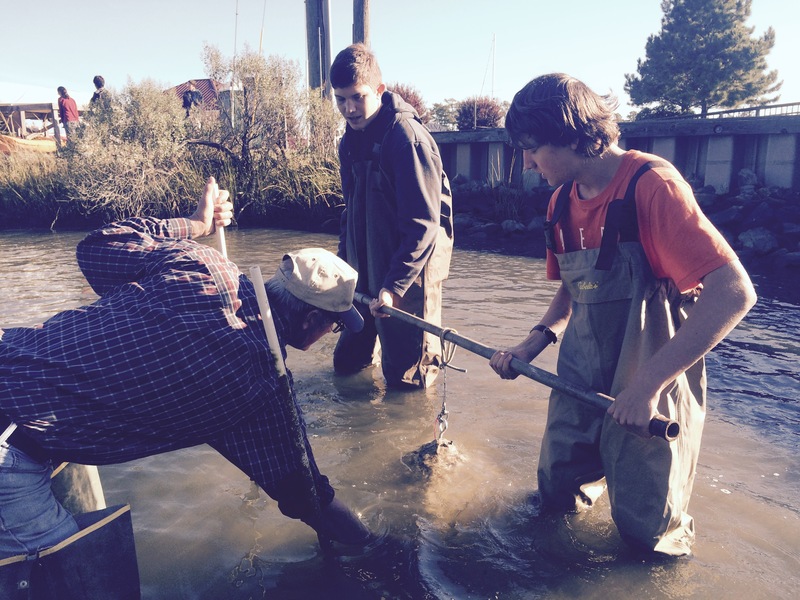 Since the programs inception, FOR has worked with High schools and middle schools throughout the Rappahannock River watershed to learn about the Chesapeake Bay, Rappahannock River, environmental issues, and restoration practices. Each year after a series of in-class lessons and activities, students join FOR and other industry partners to install a project. These projects have included riparian buffer plantings, bank stabilzation, rain gardens, and river cleanups. Thanks to funding from the Virginia Environmental Endowment, Chesapeake Bay Restoration Fund, Dominion Foundation, and several other donors, our SST has grown to include more schools and more diverse projects. This project spotlight is of our most recent restoration project in the Town of Urbanna. After a year of planning, permitting, site visits and assessments, we were able to get the students on-site for the project installation. 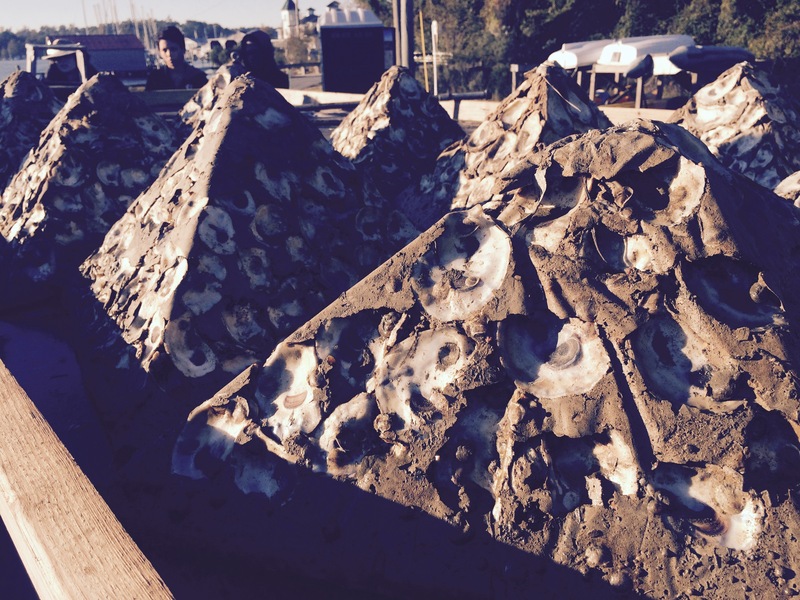 The project was lead by Sara Beam with the CBGS, FOR Tidal River Steward Richard Moncure, FOR Programs Manager Bryan Hofmann, and Chris Davis, owner of Ready Reef inc, a local marine contractor that specializes in the design and construction of 3D oyster reef structures. Over the course of two mornings the students performed an amazing array of envirmental assessments including water quality testing, vegetation assessments, and species counts on the oyster structures. They received a one of a kind lesson on Virginia’s oyster industry, their history, and importance to the River and Chesapeake Bay for habitat, water quality, and local economy. After the background was delivered and understood, the real fun began. Students squeezed into their waders, through on gloves, and began to unload and install the 3D concrete oyster reefs in a well oiled assembly line. Each structure weighs approximately 100lbs so teams of students carefully removed the structures from the trailers and then waded out to the reef area to place them in a specifc place and pattern. As they were unloaded students took inventory of the number of oyster spat (baby oysters) that were present on the structures. This data collection is important and will help show the growth and success of the reefs as the students monitor the reef over the next several years. After two days of work we successfully installed 31 structures! Each structure will eventually be home to about 100 oysters. Each oyster can filter up to 50 gallons of water per day which equates to a brand new, all natural reef that can filter 155,000 gallons of water each day! The second half of the project was the living shoreline. Over time, natural banks and shorelines can experience erosion resulting from a variety of stressors including wave energy, human impact, and removal of vegetation. 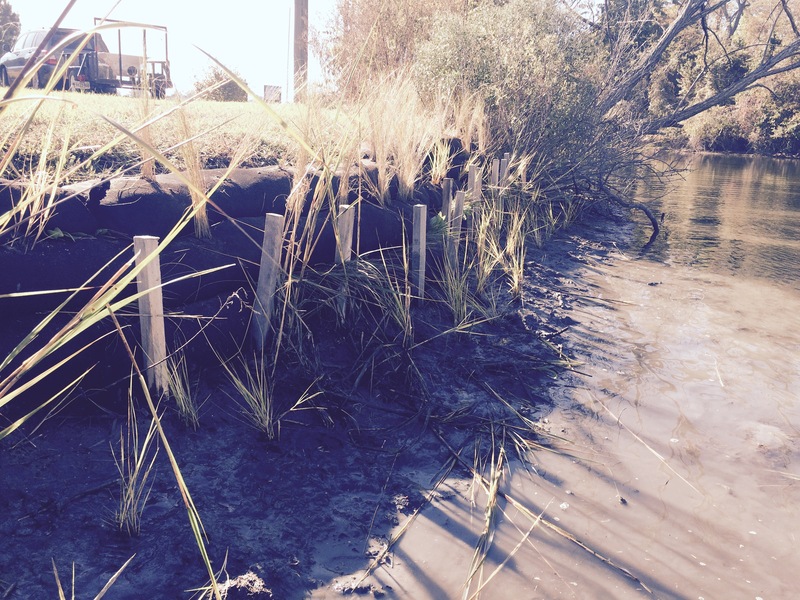 Living shorelines are the preferred method for shoreline restoration in Virginia. FOR worked with students to identify 25 linear feet of shoreline at the town marina which was experiencing erosion and was a suitable area for restoration. In the spring, students took survey measurements to inform the design of the project. Using a unique piece of machinery known as the Filtrexx Mini-fx, students created 75 feet of biologs filled with sand, pea-gravel, and compost. These logs were placed along the shoreline and stacked to meet the upland grade. We staked the logs in and then planted them with native grass plugs. This type of project is designed to control erosion, restablish wetland vegetation, and can even work to remove nutrients like Nitrogen and Phosphorus from the water cycle. We will be at the Town Marina for the Urbanna Oyster Festival to showcase the project, provide tours, and answer questions. Feel free to stop by and say hello!